Should You Follow This Wall Street Firm's Lead in Swapping NVIDIA for Skyworks Solutions? This Wall Street firm believes that Skyworks is a better bet than NVIDIA, but this Fool thinks otherwise. Shares of Apple supplier Skyworks Solutions (NASDAQ:SWKS) have shot up over 34% in 2017, thanks to a terrific earnings report earlier in the year and the possibility of substantial revenue gains with the next iPhone. On the other hand, graphics specialist NVIDIA (NASDAQ:NVDA) has failed to sustain its momentum due to growth-related concerns. BMO Capital believes that NVIDIA's gaming business is going to hit a roadblock due to weaker-than-expected GPU shipments in the March quarter. Additionally, Pacific Crest analysts have cut their NVIDIA rating to underweight from sector weight, citing saturation in the PC GPU market and possible weakness in data center sales. Pacific Crest has bumped Skyworks to overweight from sector weight, suggesting that investors should buy it over NVIDIA due to a potentially strong iPhone cycle this year. But it might not be a good idea to switch one for the other as both companies have their own strengths. NVIDIA stock has pulled back over 8% in 2017 despite a strong start to the year, giving savvy investors an opportunity to get into a high-growth company at a relatively cheap valuation. NVDA EPS Diluted (TTM) data by YCharts. The GPU maker's price-to-earnings multiple has come down to almost 38x from close to 60x earlier in the year even though its earnings have shot up rapidly. Now, Wall Street expects $0.67 per share in first-quarter earnings from NVIDIA, which will take its trailing-twelve-month earnings to $2.89 per share when it releases its results next month. What's more, analysts expect NVIDIA's earnings to rise 12% and 18% over the next two fiscal years, indicating that its bottom line momentum won't stop anytime soon. This makes the graphics chipmaker a better value after its recent pullback, especially considering the potential growth in its gaming and data center businesses. As it turns out, data center is NVIDIA's fastest-growing segment, thanks to the adoption of its Tesla GPUs by big cloud service providers (CSPs) such as Amazon Web Services, Microsoft Azure, Tencent, and the Google Cloud Platform. These CSPs are using NVIDIA GPUs to accelerate the computing power of their data centers to save costs and enhance capacity. More importantly, the demand for the Tesla GPUs should continue improving as cloud workloads increase due to a rise in data traffic, driving secular growth for NVIDIA. The gaming segment is not going to slow down anytime soon either as complex games need powerful hardware to run on, encouraging NVIDIA users to upgrade to the latest GPUs as 70% of its installed base is still running old hardware. The next iPhone could be a big deal for Skyworks as Cupertino is expected to bump the production of its next flagship to 120 million units this year as compared to last year's 89 million units. This could drive an additional $186 million in sales for the semiconductor specialist this year, even if it places only $6 worth of content in each device as it did last year. Wall Street estimates that the revenue gains at Apple will bump the chipmaker's earnings by more than 11% this year, which isn't surprising as it gets 40% of its revenue from the iPhone maker. Additionally, Skyworks is winning business in China as the likes of OPPO, Vivo, and Huawei are using its RF chips. In fact, Huawei is now its second-largest customer, which is good news for investors as the Chinese smartphone maker is making huge strides in growing its global sales. Moreover, Skyworks trades at a fair valuation despite a tremendous rally this year, as its trailing price-to-earnings multiple of 21 is close to its 13-year median P/E ratio of 20.6. Therefore, it can be considered to be a good bet thanks to its anticipated earnings growth. 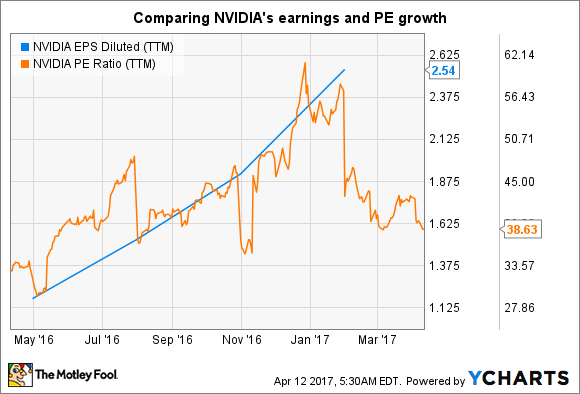 Both NVIDIA and Skyworks are poised for earnings growth because of different catalysts, and currently trade at attractive valuations. Investors, therefore, shouldn't have to choose between the two chipmakers or swap one for the other.